The first passenger train from Lhasa to Shigatse arrives in Shigatse Railway Station. (TibetanReview.net, Apr02, 2015) – The Lhasa-Shigatse Railway which China opened in Tibet last August had the capacity to carry up to 1,034 passengers per trip, although the maximum it had carried so far was about 800, with the number dropping to 300-400 at its lowest level, suggested China’s online Tibet news service eng.tibet.cn Apr 1. It added that a total of 400,000 people had made the trip so far, which if true would actually make the maximum more than 800. 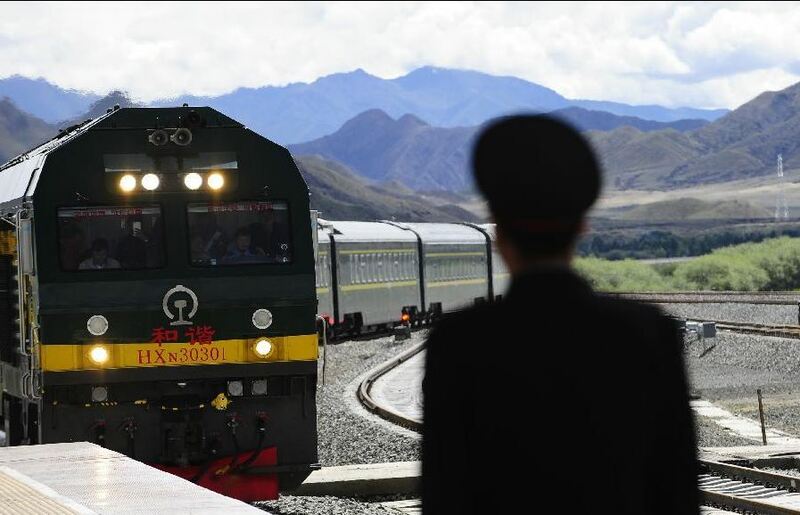 The report said the first extension line of the Qinghai-Tibet Railway currently operated two passenger trains per day: one from Lhasa to Shigatse in the morning and another from Shigatse to Lhasa in the evening with the journey taking about three hours one way. The report added that because of increased passenger traffic, two additional passenger trains will be introduced. It did not say when.